Fyfe is back next week so why trade a prem to a mid pricer although Kelly looking good. Rohan is sound bench cover so worth keeping for that purpose. I would look at one of your non playing rucks to Currie or Derrick before they rise further. Both have negative B/e so now is the opportunity to get bench cover for rucks. last week traded Fyfe to Taylor, Rohan to Buddy. Short term pain for long term structural gain. Looking at moving Caddy out this week. Here is my current side. Then looking to upgrade Caddy to a premo. Cannot afford Nroo or Boomer if I use the first trade. Hope to get back to a 2200+ week. Would have went Cunningham and Caddy for Pavlich and Crouch but up to you. Round 5: 2216. Went up approximately 5k in the rankings. Ellis to Robbo is locked in. Looking at Tyson to Swan/Griffen/Murphy or McVeigh. nice. get those premiums in quick. the quicker the better your rank will be. good luck mate, keep climbing. Round 6: 2138 scored. Went up approx 4k in the rankings to 23,477. Going to Downgrade Cunningham to Hallahan. Nice unique team AK - just need your premiums to fire! Have you planned out your trades over the bye period? With Buddy out I am getting rid of him- too much of a liability. This does leave me with less $ in the bank but a bye structure of 10/10/10 and bring in a bone-fide premo who I want in my side at the end of the year. No real planning- just a rough guide to how to bring in gun mid premos during the bye. Buddy out has thrown it around a fair bit- Means I remain at 6 upgrades left but I bring in Smitch who I had planned to bring in after round 9. Nice team and trades mate, like the look of Hallahan, he's really done the hard yards and earnt his spot in a very good team. How good is Swallow, I'm envious! Only scored the 2197 last week. Dropped 102 spots overall. Trades this week: Been tossing and turning on what to do. 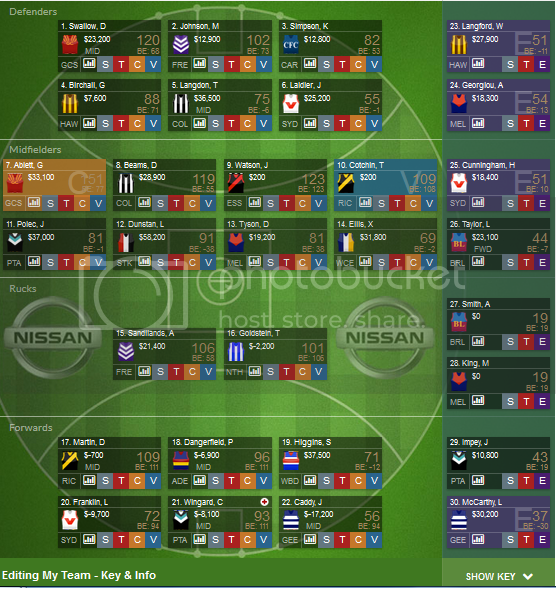 I waited on team selections and have decided to go Ambrose/Gardiner/Fyfe in for Georgiou/Crouch/Smitch. Will have $155,800 in salary to make upgrades next week. Looking at bringing in Pendles and another premo. Looking at Bartel in defense, Stevie J or Selwood in the mids or Parker in the forwards. 1711 in the first bye round. Moved from 23,579 overall to 12,666. Pretty easy decisions- had to get rid of Langdon to bring the premo's in that I wanted.